If you’re looking for a high-performance scuba regulator that also works flawlessly for cold water diving, then the Scubapro Mk25 Evo/S600 should definitely be on top of your shortlist. Over the years the MK25 first stage has earned a reputation for its reliability and its ability to deliver unmatched performance in extreme driving conditions. It’s recently been upgraded to the new MK25 Evo, which can now withstand 30 percent colder water than the traditional MK25. Paired with the easy breathing and adjustment possibilities of the S600 Second Stage, it becomes a scuba regulator system that can adapt to any diving condition and diver preference. Pricey, out of the price range of most divers. The Scubapro MK25 Evo/S600 is a high performance regulator that delivers effortless breathing in all water temperatures and depth. Diver adjustable Venturi Switch and inhalation resistance knob allow you to fine-tune your breathing on the fly to match any dive condition or preference. Who Is This Regulator Designed For? Below is a quick video review of the regulator done by the guys over at Simplyscuba.com. In the video, you can get a closer look at the regulator and some of its features. The MK25 Evo uses a balance piston to deliver ultra stable intermediate pressure to the balanced S600 second stage, resulting in a consistent performance at any tank pressure and depth. It also features five low-pressure ports on a 360 degrees swiveling turret (four on the side and 1 on top) for optimum hose routing. This feature also helps reduce jaw fatigue by reducing the tension on the low-pressure hoses. The MK25 EVO is designed with Scubapro’s new Extended Thermal Insulating System (XTIS) which fully isolates the important internal mechanisms from the environment. This greatly improves the ability of the regulator to resist freezing in colder water, without sacrificing its overall performance. With this technology, the EVO can withstand 30 percent colder water than the traditional MK25. It also features a user adjustable venturi switch to easily manage free flows on the surface and breathing resistant knob to fine tune your breathing. In the “Max” position it allows the regulator to perform at its optimum performance. Turning the Knob to the “Min” position puts more tension on the spring, resulting in lower air flow rate, which is great for diving in cold water condition, and help prevent free flow while diving in heavy currents. The Knob is also big enough to be easily operated even while wearing thick gloves. Its' 2 high pressure ports on either side and 5 low pressure ports on swiveling torrent allows you to mount the regulator in either direction. This Scubapro regulator system deliver exception breathing performance in any position, depth, or tank pressure. This regulator is designed to last a lifetime. It's Constricted from durable high end materials and does not feel cheap in any way. Pricey, but with all the performance you would expect from a top of the line scuba regulator. It’s easy to see why this regulator is considered one of the top-performing regulator today. It has consistently gotten top ratings from reviewers for its exceptional performance and low work of breathing. The second stage adjustment knob is easy to operate even while wearing thick gloves, and you can feel the adjustment almost immediately. Some people report that tightening up the breathing actually lengthens your bottom time. But, when you open it up, it is one of the best breathing regulators out there. The swiveling turret also does help reduce tension on the second stage hose, and there was virtually no tugging when you turn your head like other regulators, which greatly helps with jaw fatigue. It has 2 high-pressure ports on both sides of the regulator which allows you to mount the regulator in either direction. When mounted downwards, it makes the regulator more streamlined and reduces accidentally hitting you in the back of your head. There is not much we didn’t like about the MK25 Evo/S600. The only complaint we were able to find was the price, this is not a cheap regulator. However, if you can afford it, you cannot go wrong with this reg, even if you are just starting out. Who Is MK25 Evo/S600 Designed For? 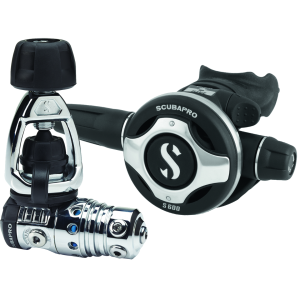 The Scubapro Mk25 Evo/S600 is a high-performance scuba regulator that is great for both recreational or technical divers. However, it is quite expensive and might be out of your price range for a lot of divers. If you are someone that only dives a couple times a year in warm tropical waters, there are cheaper regulators out there that would work perfectly for your type of diving. But, if you’re someone that demand the performance of a high-end regulator, and have the budget, this is the regulator to get. Does this regulator system comes with an octopus? Regulators are generally only only sold with the first stage and primary second stage. You will have to buy the octopus and other peripherals separately. However, some retailers may bundle them in one package. Although the MK25 Evo/S600 make an excellent Tech Diving regulator, it work just as good for recreational diving as well. The Scubapro Mk25 Evo/S600 is a top-performing regulator, and offer exceptional breathing at recreational depth but still have the capacity to perform flawlessly when pushed to the extremes. If you’re looking for a reliable regulator that simply performs, look no further than this one, you will not be disappointed. Do you have any experience with the MK25 Evo/S600, good or bad, please feel free to share in the comments below.